Glamorgan fast bowler Michael Hogan is set to return from injury for their next County Championship match against Derbyshire on 3 May. Hogan, 33, hurt a hamstring playing for Western Australia and has missed Glamorgan's first two fixtures. But the county's 2014 player of the year expects to face Derbyshire in Cardiff a week Sunday. "The doctor and physio are pretty keen on me playing against Derbyshire so I'm pretty positive," said Hogan. "I've got a few bowling things to do over the next week and a half, but I'm confident I'll be there for Derbyshire." 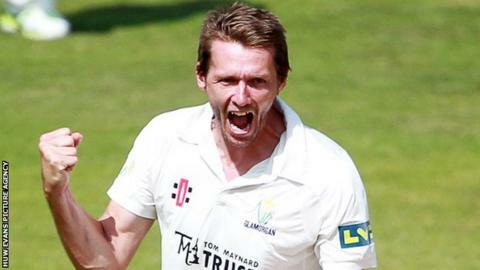 Hogan has been a crucial strike bowler for Glamorgan in the last two seasons, claiming 98 wickets in all competitions last season despite missing three weeks on paternity leave. He suffered a hamstring injury playing for Western Australia in February but is now ready to return. "It's good to finally have that date," added Hogan. "Now I've got that date I'm absolutely ready to go."